After back-to-back Brooklyn-Queens GCHSAA ‘A’ division titles, the Msgr. 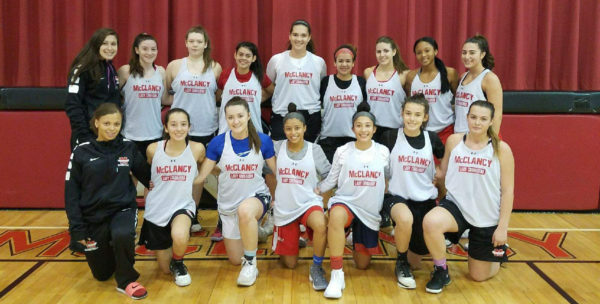 McClancy H.S., East Elmhurst, girls’ varsity basketball team knows it has a target on its back. Therefore, the team has set out to do whatever it takes this season to capture a third consecutive title. In fact, the motto “Whatever It Takes” has been the rallying cry of the Lady Crusaders since tryouts in August. Scrimmages began in early November, and McClancy will officially open the season Dec. 2 at the annual Brother Arnold Memorial Tournament. This year will be the first time girls’ teams will be playing in the tournament. As has become a tradition the past five years, the Lady Crusaders enjoyed team Mass at Corpus Christi, Woodside, to kick off the year. Father John O’Neill, weekend associate, was the celebrant and wished the team well upon its journey. The Lady Crusaders will have six returning players. In addition to winning back-to-back diocesan titles, the team has its sights set on making a run to a state title, which it won in 2016 and reached the semifinals in 2017. Even the best teams can always find areas for improvement, and it appears McClancy has already pinpointed these as the regular season gets underway. The players are each trying to get one percent better every day, and if they do that, good things will happen in the end. Fontbonne Hall Academy, Bay Ridge, and St. Joseph’s H.S., Downtown Brooklyn, are expected to be the toughest competition for the Lady Crusaders this season in the ‘A’ division. Emphasizing defense will be the key to beating these other top teams. The team is hoping for an immediate impact from sophomore guard Catherine Finnerty, who played on the JV last season. Additionally, Brittany Stenz, a junior forward with key minutes off the bench last year, will see an increased role this season. The girls have been hard at work in anticipation for another strong season. They’re doing whatever it takes in practice and hoping that effort translates nicely into games. “Last year we won the BQ’s and whatever it takes this year to get that far again, we’re going to do it,” said senior guard and captain Rhona McCaughey, who recently accepted a full athletic scholarship to play basketball at Concordia College, Bronxville. So what exactly will it take for the Lady Crusaders to pull off the three-peat? If McClancy does whatever it takes through hard work, discipline and focus, we’ll surely be talking about the team again come playoff time.